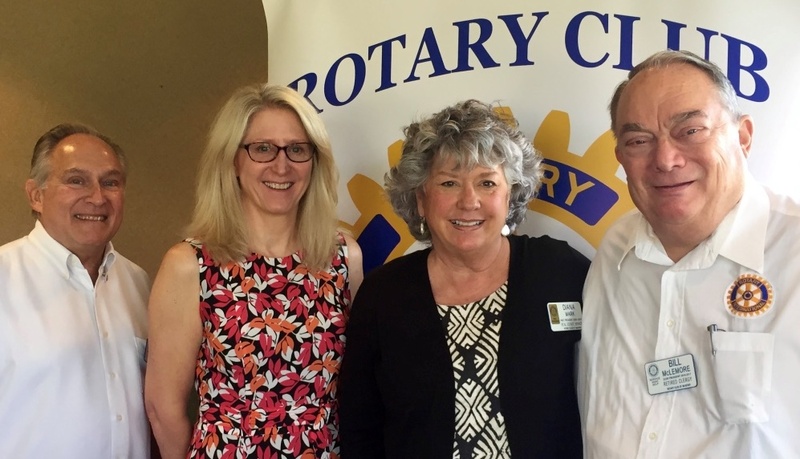 The Rotary Club of McHenry is pleased to announce the induction of Cynthia Wolf as an Honorary Member. Our Constitution and Bylaws provide: “Persons who have distinguished themselves by meritorious service in the furtherance of Rotary ideals and those persons considered friends of Rotary for their support of Rotary’s cause may be elected to Honorary Membership in this Club.” Cynthia has manifested this in many ways far exceeding those required. Welcome Cyndi. Cynthia Wolf is a McHenry native who attended McHenry East and West campuses and graduated from the Southern Illinois University at Carbondale School of Communications. After working at several newspapers — including 20-plus years in various reporting and editorial management roles at the Northwest Herald — she embarked on a freelancing career, developing what is now Wolf Wordsmithing. Cynthia supplies writing, editing and marketing services for a variety of clients, currently including the Rotary Club of McHenry, Volo Auto Museum and the Illinois Governor's Office of Communications. You can review Cyndi’s full resume by clicking here. Cynthia’s sponsor is Diana Mark, a Member of the Blues, Brews and Barbeque Committee and our Club Service Chair. William “Bill” McLemore (past District Governor of Rotary District 6880 (1998-1999) and current Member of the Rotary Club of McHenry) served as the officiant to induct Cyndi into our Club.